This emergency mold remediation project required Snyder Environmental crews to respond and remediate a local office building with-in three days. Snyder removed the lay-in ceiling tiles, dismantled the HVAC duct work and removed existing mold found within the office space. Snyder crews contained the building under negative pressure, protected the carpet and covered desks. 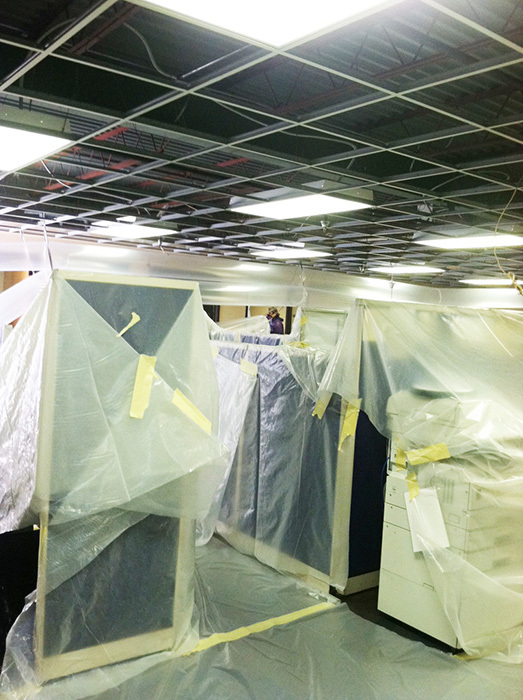 After demolition of the lay-in ceiling tiles, Snyder bagged the ductwork and removed it. Every square inch of the building was cleaned with an algaecide fungicide disinfectant. Before completing the remediation project, Snyder cleaned the building’s roof deck and joist, and painted it with a 40/20 fungus-prohibitive coating.